Una de las mejores figuras de los últimos años, el esperado Grimlock Masterpiece. Es increíblemente detallado,de excelente calidad y muy fiel al G1. Vale cada centavo que pagué por él. Excelente forma de conmemorar la figura número 250 de mi colección. 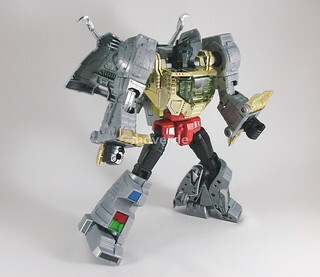 One of the best figures in the last years, the long awaited Grimlock Masterpiece. He has amazing details and gimmicks, and he's a great homeage to the G1 version. It's worth every penny and it's an excellent way to commemorate the 250th figure in my collection.